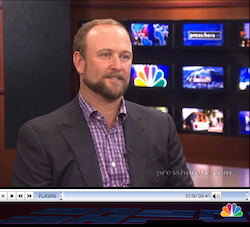 Our co-founder Marc Heyneker was recently invited to join Joie de Vivre founder and CEO Chip Conley on NBC’s Press:Here, a Sunday morning news roundtable discussion show about Silicon Valley featuring top tech leaders and world class technology reporters. Check out the video here. On the show Marc discusses how savvy hotels are using social media, and how hotel recommendation and discovery has dramatically changed in recent years. In other clips Chip Conley discusses his experience with Joie de Vivre, one of our favorite clients, and how Revinate has become an invaluable tool for their great hotels. Also on the program are host Scott McGrew, Jon Fortt of Fortune and Kum McNicholas of Forbes.